Department of Dermatology and Venereology* and Department of Inorganic Chemistry**, Faculty of Medicine and Science, Tanta University. Background : Alopecia areata (AA) is a non-scarring, inflammatory, hair loss disease with an unpredictable course. It is commonly manifested by patchy areas of complete hair loss on the scalp and other hair-bearing areas in the body that can progress to complete loss of all body hair. AA is a T-cell-mediated autoimmune condition that is most likely to occur in genetically predisposed individuals. Different cytokines such as Interleukin 1 ( IL-1), tumor necrosis factor alpha (TNF-α) and Interferon gamma (IFN-γ) are thought to be involved in the pathogenesis of AA. Proper cell metabolism and effective immune function are dependent on a total of 72 trace elements e.g., zinc (Zn), copper (Cu) and selenium (Se). Disturbances in the levels of Zn, Cu and Se are thought to play a role in the pathogenesis of AA through affecting the levels of different cytokines. Aim of the Work: The aim of this study was to explore the role could be played by the trace elements ( Zn, Cu and Se ) in the pathogenesis of AA. Patients and Methods: This study included 44 patients with a single patch of AA (group I), 36 patients with multiple patches of AA (group II) and 20 healthy control individuals (group III). Venous blood samples were taken from all the participants and then these samples were analyzed by flame atomic absorption spectrophotometer (FAAS) to estimate the serum level of Zn, Cu and Se. Results: There were statistically significant decrease in the serum level of Zn, Cu and Se of both groups of AA patients than controls, but there was no difference in the serum levels of the studied elements between the two groups of AA patients. There was a statistically significant decrease in serum level of Zn and Cu in males of group II than those of group I, also, there was a statistically significant decrease in serum level of Se in the females of group II than group I. There was a statistically significant difference in the serum level of Zn in group I and II in age ≤ 30 and > 30 years. There was a statistically significant decrease in serum level of Zn (group II) than (group I) when the duration of the disease is ≤ 2 months. There were no significant relations between the studied trace elements and the rest of clinical parameters. Conclusion: Serum of both groups of AA patients expressed low levels of Zn, Cu and Se when compared with controls suggesting their possible role in the pathogenesis of AA. Alopecia areata is a chronic, non scaring inflammatory disease which affects the hair follicles (HF). The onset may be at any age and there is no known race or gender predominance. 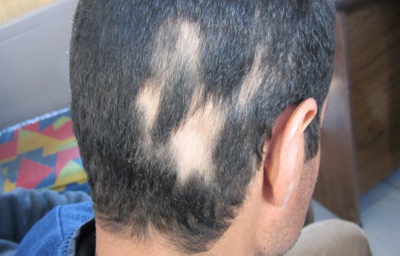 AA can present with many different patterns; a flat alopecic patch with normal skin color, involving the scalp or any other pillar region of the body is the characteristic lesion of AA but the disease can progress to complete loss of all body hair. AA may be associated with nails abnormalities; as pitting and longitudinal or transverse striations. Sometimes, concurrent atopic disorders, diabetes mellitus and other autoimmune disorders may alter the course and prognosis. The patho-physiology of AA is considered to be T-cell mediated autoimmunity that occurs mostly in genetically predisposed individuals. In addition to the disturbance of the immune function, complex interactions between predisposing genetic and environmental factors act as triggers for disease progression. In order to maintain vital processes, trace elements (e.g. Zn, Cu and Se) must be present in the human body within certain concentration ranges. They fulfill special biological functions e.g. as catalysts in the synthesis of proteins and enzymes. Zn is one of the most abundant nutritionally essential elements in the human body. It has both catalytic and structural roles in enzymes. Cu is an essential trace element, important for the function of many cellular enzymes. It is the third most abundant trace element found in the body (after iron and Zn). Se, an essential trace element that has a protective, immune modulating and anti-proliferative properties. Many of the functions of Se are thought to be mediated by selenoproteins that contain Se in the form of the amino acid, selenocysteine. There are claims that imbalance of trace elements in the serum of AA patients may trigger the onset of the disease. The aim of this work was to evaluate and provide an insight about the possible role of the trace elements, ( Zn, Cu and Se ) in the etiopathogenesis of AA. The current study comprised a total of 80 patients of different varieties of AA (single and multiple patches) in addition to 20 healthy individuals who were randomly selected as a control group with no history of any systemic or skin disease. All persons, representing both genders and different age groups. The patients were diagnosed on the basis of the typical appearance of the skin lesions. The studied persons were collected from the Outpatient Clinic of Dermatology and Venereology Department, Tanta University Hospitals during the period from March to September 2011. Group I : included 44 patients with single patch of AA. Group II : included 36 patients with multiple patches of AA. Group III : included the 20 healthy persons served as a control group. Newly diagnosed cases who did not receive any topical or systemic treatment in the past 6 weeks and patients who did not have any other skin (e.g. atopic dermatitis, lichen planus or vitiligo) or systemic diseases (e.g. thyroid disease, collagen-vascular diseases, diabetes mellitus, down syndrome, autoimmune polyendocrine syndrome type I, myasthenia gravis, pernicious anemia or ulcerative colitis). All patients agreed to join the study and signed a written consent. Old AA cases who received recent systemic treatment in the past 6 weeks, pregnant and lactating females or those who were receiving any hormonal contraceptive drugs and patients currently taking nutritional supplements, magnesium containing laxatives or diuretics. Full history taking including personal history, present history, past history of diseases or drugs used and family history, thorough general examination, detailed dermatological examination including; skin, mucous membrane and nail examination and laboratory investigations which include: routine laboratory investigations, thyroid function tests and estimation of serum level of Zn, Cu and Se by FAAS. Venous blood samples were withdrawn, from the antecubital vein, using a dry wide pore needle in all cases. Blood was put in glass tubes previously treated with deionized water and dried. The samples were then allowed to clot in a water bath at 37°C and centrifuged at 3000 rpm for 5 minutes. The collected serum was put into dry test tubes, covered and kept in the refrigerator at - 20°C till analysis. 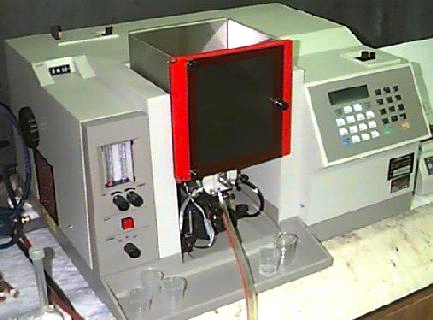 The method used in this work was the flame technique of atomic absorption spectro-photometer (FAAS) for determination of Zn, Cu and Se. It is a spectroanalytical procedure for the qualitative and quantitative determination of chemical elements employing the absorption of optical radiation (light) by free atoms in the gaseous state (Fig. 1). FAAS can be used to determine over 70 different elements in a solution or directly in solid samples. Since samples are usually liquids or solids, the analyte atoms or ions must be vaporized in a flame or graphite furnace. The atoms absorb ultraviolet or visible light and make transitions to higher electronic energy levels. The analyte concentration is determined from the amount of absorption. Concentration measurements are usually determined from a working curve after calibrating the instrument with standards of known concentration. *The clinical photos of AA patients were illustrated in Fig. 2 and 3. Fig 2: Male patient with two patches of alopecia areata in the beard area. 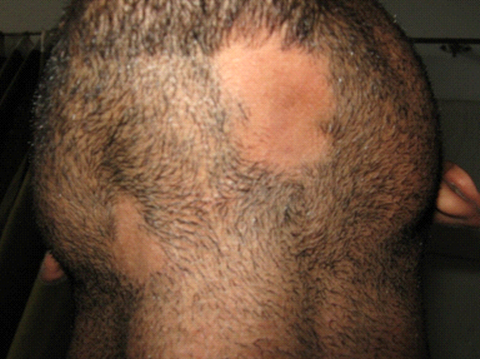 Fig 3: Male patient with multiple patches of alopecia areata in the scalp. * The clinical criteria of the studied groups were demonstrated in Table 1. * There was a statistically significant decrease in serum Zn, Cu and Se level in AA groups than controls, but there was no significant difference in serum Zn, Cu and Se level between group I and group II AA patients (Table 2). * There was a statistically significant decrease in Zn/Cu ratio and increase in Cu/Se ratio between AA groups and controls, but no significant difference was detected between both AA groups (Table 3). * There was a statistically significant difference in Zn/Se ratio between both AA groups, but there was no significant difference between AA groups and controls (Table 3). * As regards gender, there was a statistically significant decrease in serum level of Zn and Cu in males of group II than those of group I and there was a statistically significant decrease in serum level of Se in females of group II than those of group I (Table 4). * As regards age, there was a statistically significant difference in the serum level of Zn in group I and II in age ≤ 30 and > 30 years (Table 5). * There was a statistically significant decrease in Zn (group II) than Zn (group I) when the duration of the disease is ≤ 2 months (Table 6). * There were no significant relations between the studied trace elements and the rest of clinical parameters. Alopecia areata is a disease of the anagen stage HFs with multifactorial etiology and a strong component of autoimmune origin. AA is characterized by either patchy hair loss or more generalized alopecia that results in complete loss of scalp hair ( alopecia totalis) or body hair (alopecia universalis) . In addition to the disturbance of the immune function, complex interactions between predisposing genetic and environmental factors act as triggers for disease progression. Also, perifollicular nerves and vasculature, viruses, trace element alterations, endocrine disorders and thyroid dysfunction have been hypothesized. There are claims that imbalance of trace elements may trigger the onset of AA. In the present study we tried to evaluate and provide an insight about the possible role of the trace elements, ( Zn, Cu and Se ) in the etiopathogenesis of AA. The current study was carried out on 80 AA patients classified according to number of lesions into group I (included 44 patients with single patch of AA), group II ( included 36 patients with multiple patches of AA) and 20 healthy controls to evaluate the possible involvement of serum Zn, Cu and Se in the pathomechanism of AA. Estimation of serum levels of the previous trace elements was done by FAAS. Alopecia areata in the present study, was presented in ages ranged from (18-45) years with mean ± SD (29.5 ± 8.1) years and this was in agreement with the previous studies  , and disagreed with the study of another one which found that 70% of the cases occurred between 10 and 25 year . In the current study, AA affects both gender with male to female ratio 1:1 which is comparable to one study , but other one has been observed that with relation to the severe forms, 63% occur in men and 36% in women. A study conducted by Bhat et al 2009  showed an increased incidence of AA in men compared to women (17:8). In the present study the duration of the disease, ranged from 1 to 6 months, which is in agreement with the study conducted by Kato et al 1988, in which the duration of the disease was found to be ≤ 6 months in about the half of the 50 studied patients. In the present study, positive family history of AA was seen in 5% of all the patients. One study conducted on 206 AA patients revealed that the estimated lifetime risks were 7.1% in siblings, 7.8% in parents and 5.7% in offspring  ,while some authors found positive family history in (8.4%) of 1032 AA patients . In the current study there was a statistically significant decrease in the mean serum Zn level in both AA groups than controls and comparison between the both AA groups revealed insignificant difference. These results were in agreement with many previous studies, as they found statistically significant low levels of Zn in AA patients compared to controls, , , . Also, one study found a lower level of Zn in blood and urine of children with AA than normal children(25). On the other hand; Shin et al 2011  found significantly decreased serum level of Zn in patients, with different patterns of hair loss including AA, when compared with controls while another study did not find any difference in serum Zn concentrations of AA patients compared to the normal population . Some authors stated that Zn deficiency causes the increase in the chemical messenger TNF-α, which causes the immune system to attack healthy tissues throughout the body, including hair . In the study conducted by Park et al 2009 , 15 AA patient were given Zn supplementation and after 12 weeks there was a statistically significant increase in serum Zn level in the improved patients than those with less improvement. It can be of quite significant clinical importance since this trace element acts at molecular level and is active at very minute concentrations. Zn deficiency induced by trace elements replacements with heavy metals can cause the onset of alopecia besides other factors. Zinc is an essential cofactor for multiple enzymes and it is involved with important functional activities in the HF. Further, Zn is a potent inhibitor of HF regression and it accelerates HF recovery. Hönscheid et al 2009  concluded that Zn homeostasis has a strong impact on T-lymphocytes. During Zn deprivation, their development, polarization into effector cells and functional effectiveness is impaired. Several molecular targets exist, including proteins involved in the regulation of apoptosis, like Bcl-2/Bax and caspases. Additionally, signal transduction involving protein kinase C and lymphocyte protein tyrosine kinase is promoted by Zn and the inhibition of IL-1 receptor-associated kinase leads to suppression of T-cell activity in response to Zn supplementation. In the current study, there was a statistically significant decrease in the mean serum Cu level in AA groups than controls and comparison between both AA groups revealed insignificant difference, this was in agreement with the study which found the serum levels of Cu were slightly lower in AA patients than in healthy controls, while another study found statistically insignificant difference in serum Cu level between controls and patients with different patterns of hair loss including AA . Park et al 2007  found decreased serum level of Cu in cases of diffuse alopecia in women. But this was in disagreement with the previous studies ,which they found serum Cu level in patients was slightly increased than controls but it was statistically insignificant [15,20] On the other hand another study found that, the level of hair Cu and plasma Cu in children with AA was significantly higher than normal healthy children  . Amirinia et al 2011  found that low levels of Zn and Cu in the hair and serum may play a role in the pathogenesis of AA and AGA. Another study interpreted the statistical association of blood and serum levels of Zn, magnesium and Cu in patients with many dermatological disorders including AA and after comparing with healthy people; they did not find any change in serum levels of Zn and Cu, but found a significantly higher level of magnesium. It has been suggested that a possible reason for these different findings may be explained on the basis of sample size, methodology and population variation . As regards serum Se level, in this study there was a statistically significant decrease in serum Se level in AA groups than control and comparison between the both AA groups revealed non significant difference. This was in agreement with one study which found that mean serum Se level was significantly lower in AA patients, compared with control group, they did not observe any significant association between the extent of AA and serum Se level . Also previous study obtained low Se concentration in serum samples of a few AA patients and suggested this fact may be as the result of low Se content in their population foods. Se, an essential trace element, has immuno-modulating and antiproliferative properties . Se deficiency depresses the effectiveness of immune cells generally. Supplementation with Se seems to boost cellular immunity by three mechanisms: first, it up-regulates the expression of the T cell high-affinity IL-2 receptor and provides a vehicle for enhanced T-cell responses; second, it prevents oxidative stress-induced damage to immune cells; third, it alters platelet aggregation by decreasing the ratio of thromboxane to leukotrine production. Measurement of Se in plasma or serum is a frequently used method for assessment of Se nutritional status. Some authors stated that when healthy and immuno-suppressed individuals were supplemented with 200 mcg/day of Se as sodium selenite for eight weeks showed an enhanced immune cell response to foreign antigens compared with those taking a placebo. A considerable amount of researche also indicates that Se plays a role in regulating the expression of cell-signaling molecules called cytokines, which orchestrate the immune response. one study found that, in Hashimoto's thyroiditis patients , selenomethionine inhibited lymphocyte release of IL-2, INF-γ and TNF-α, which was accompanied by a reduction in plasma C- reactive protein levels, this is suggesting probable role of Se in the etiopathogenesis of AA as another autoimmune disease and also suggesting the expected benefit of Se supplementation in treating AA. Another study reported that TNF-α is well known to play a major role in the pathogenesis of AA, causing vacuolation of matrix cells within the follicle bulb and a decrease in the size of the matrix, as well as disorganization of follicular melanocytes and abnormal differentiation and keratinization of the precortical cells and the internal root sheath . In the present study, there was a statistically significant decrease of Zn/Cu ratio in both AA groups when compared with controls, which is in disagreement with the previous study which found insignificant difference as regards serum Zn/Cu ratio in AA patients. Also, there was no statistically significant difference in Zn/Se ratio and a statistically significant increase in Cu/Se ratio in both AA groups than controls. Another study which included 151 patients of various skin diseases including AA, stated that Cu/Zn ratio showed significantly different values in those patients, suggesting that the Cu/Zn ratio clearly reflects the severity of the progress of the disease. But another found that, ratios of Cu/Zn were slightly higher in AA patients than in healthy controls but their differences were not statistically significant. In the current study, there was no significant difference between serum trace elements and concerned clinical parameters in all AA groups as gender (except for Zn and Cu, decreased in males of group II than group I, Se was decreased in females of group II than group I), age (except for Zn in group I and II), duration of the disease (except for Zn in group II when the duration is ≤ 2 months, which disagreed with the one study which found more decreased levels of Zn in those patient with prolonged duration and extensive lesions) . This may be due to relatively small numbers of the studied cases. However, no available references in all literature deal with all variables. There was a significant decrease in the serum levels of the studied three trace elements recorded in this study. There was no statistically significant difference between AA and different clinical parameters ( age, gender, duration of the disease and family history ) except in few of them so, in the view of the small sample size, further investigations are needed. We suggest that a serum Zn, Cu and Se assay should be included in the chemical assessment of patients with AA and that trace elements ( Zn, Cu and Se ) supplementations need to be given to AA patients who have low serum levels. The present study suggests that the previous trace elements supplementation could become an adjuvant therapy for the AA patients with low serum levels and for whom the traditional therapeutic methods have been unsuccessful. The use of individualized trace element supplementation is recommended than multiple ones. Study of the trace elements level in AA patients before and after treatment to determine its level with the prognosis of the AA. The current study advise for further studies on the all trace elements in the serum and hair of AA patients. 1. MacDonald Hull SP, Wood ML, Hutchinson PE,etal. Guidlines for the management of alopecia areata. Br J Dermatol 2003;692-699. 2. Rivetti EA. Alopecia areata: A revision and update. An Bras Dermatol 2005;80:57-68. 3. Kuldeep CM, Himanshu S, Khare AK,etal. Randomized comparison of topical betamethasone valerate foam, intralesional triamcinolone acetonide and tacrolimus ointment in management of localized alopecia areata. Int J Trichol 2011; 3: 20-24. 4. McDonagh AJ and Messenger AG. The pathogenesis of alopecia areata. Dermatol Clin 1996;14:661-670. 5. McDonagh AJ and Messenger AG. The aetiology and pathogenesis of alopecia areata. J Dermatol Sci 1994;7:S125-S135. 6. Hatfield DL and Gladyshev VN. How selenium has altered our understanding of the genetic code. Mol Cell Biol 2002;22:3565-3576. 7. Huang X, Cuajungco MP, Atwood CS,etal. Alzheimer's disease, β-amyloid protein and zinc. J Nutr 2000; 130 :1488S-1492S. 8. Tapiero H and Tew KD. Trace elements in human physiology and pathology: Zinc and metallothioneins. Biomed Pharmacotherapy 2003;57:399-411. 9. Tapieroa H, Townsend DM and Tew KD. Trace elements in human physiology and pathology: Copper. Biomed Pharmacotherapy 2003;57:386-390. 10. Kotulanová A and Komárek J. Determination of copper in biological materials by atomic absorption spectrometry. Acta Chim Slov 2002;49:437-445. 11. Filippou DK, Filippou G, Trigka A, etal. Malignant proliferating trichilemmal tumour of the scalp. Report of a case and a short review of the literature. Ann Ital Chir 2006;77:179-181. 12. Mussalo-Rauhama H, Lakomaa EL, Kianto U etal. Element concentrations in serum, erythrocytes, hair and urine of alopecia patients. Acta Derm Venereol 1986;66:103-109. 13. Welz B and Vale MGR. Analytical instrumentation handbook: Atomic Absorption Spectrometry and Related Techniques 3rd edn. Cazes J and Dekker M (eds.). New York 2005; chapter :7, p.75-125. 14. Gregoriou S, Papafragkaki D, Kontochristopoulos G,etal. Cytokines and other mediators in alopecia areata. Mediat Inflamm 2010; 2010: 928030. 15. Bhat YJ, Manzoor S, Khan1 AR,etal. Trace element levels in alopecia areata. Indian J Dermatol Venereol Leprol 2009;75:29-31. 16. Price. V. Alopecia areata: Clinical aspects. J Invest Dermatol1991;96:685. 17. Camacho F. Alopecia areata: Clinical features. Dermatopathology. In: Trichology: Diseases of the Pilosebaceous Follicle. Camacho F and Montagna W (eds.). Madrid: Aula Medica Group 1997; p. 417-440. 18. Pimentel ERA. Alopecia areata. Aspectos imunologicos e tratamento pelo DNCB. Universidade de Säo Paulo 1988. 19. Dawber RPR, de Beker D and Wojnarowska F. Disorders of hair. In: Textbook of Dermatology. Champion RH, Burton JL, Burns DA and Breathnach SM (eds.). Oxford : Blackwell Science 1998; p.2919-2927. 20. Kato AM, Baghagho SA and El-Maadawy IH. A study of some trace elements profiles and cystine in patients with alopecia. Thesis of Tanta University 1988; chapter 4, p. 83-99. 21. Blaumeiser B, van der Goot I, Fimmers R, etal. Familial aggregation of alopecia areata. J Am Acad Dermatol 2006;54:627-632. 22. Yang S, Yang J, Liu JB, et al. The genetic epidemiology of alopecia areata in China. Br J Dermatol 2004;151:16-23. 23. Lee SY, Nam KS, Seo YW,etal. Analysis of serum zinc and copper levels in alopecia areata. Am Dermatol 1997;9:239-241. 24. Park JY, Lee JC, Jung HD, et al. Feasibility of clinical and laboratory diagnostic approach to chronic female diffuse alopecia in dermatologic outpatient clinic. Korean J Dermatol 2007;45:791-796. 25. Naginiene R, Kregzdyte R, Abdrakhmanovas A,etal. Assay of trace elements, thyroid gland and blood indices in children with alopecia. Trace Elem Electrol 2004;21:207-210. 26. Shin SJ, Yoo CS, Kill MS,etal. Analysis of serum zinc and copper concentrations in hair loss patients. 63rd year of Korean Dermatology Conference 2011; p.140. 27. Haase H and Rink L. The immune system and the impact of zinc during aging. Immun Ageing 2009;6:9. 28. Park H, Kim CW, Kim SS,etal. The therapeutic effect and the changed serum zinc level after zinc supplementation in patients with alopecia areata who had a low serum zinc level. Ann Dermatol 2009;21:142-146. 29. Plonka PM, Handjiski B, Popik M,etal. Zinc as an ambivalent but potent modulator of murine hair growth in vivo preliminary observations. Exp Dermatol 2005;14:844-853. 30. Hönscheid A, Rink L and Haase H. T-Lymphocytes: A target for stimulatory and inhibitory effects of zinc ions. Endocr Metab Immune Disord Drug Targets 2009; 9:132-144. 31. Naginiene R, Abdrachmanovas O, Kregzdyte R,etal. Investigation of heavy metal in people with alopecia. Trace Elem Electrol 2002;19:87-90. 32. Amirinia M, Sinafar S, Sinafar H,etal. Assessment of zinc and copper contents in scalp hair and serum and superoxide dismutase, glutathione peroxidase and malondialdehyde in serum of androgenetic alopecia and alopecia patients. Med J Tabriz Univ Med Sci 2011;33. 33. Bruske K and Salfeld K. Zinc and its status in some dermatological diseases: A statistical assessment. Z Hautkr 1987;62:125-131. 34. Feizy V, Mortazavi H, Barikbin B,etal. Serum selenium level in Iranian patients with alopecia areata. JEADV 2008;22:1236-1278. 35. Kiremidjian-Schumacher L, Roy M, Glickman R,etal. Selenium and immunocompetence in patients with head and neck cancer. Biol Trace Elem Res 2000;73:97- 111. 36. Oguntibeju OO, Esterhuyse AJ and Truter EJ. Possible benefits of micronutrient supplementation in the treatment and management of HIV infection and AIDS. African J Pharm Pharmacol 2009;3:404-412. 37. Krysiak R and Okopien B. The Effect of levothyroxine and selenomethionine on lymphocyte and monocyte cytokine release in women with Hashimoto's thyroiditis. J Clin Endocrinol Metab 2011; 96:2206-2215. 38. Tasaki M, Hanada K and Hashimoto I. Analyses of serum copper and zinc levels and copper/zinc ratios in skin diseases. J Dermatol 1993;20:21-24.